Now it's time to tackle the partisan offices. When it comes to higher profile races, it's easy to face information overload. The Reno News & Review just released their Election Guide and their list of endorsements, plus the Libertarian Party of Nevada released their Voter Guide at the beginning of this week, the Reno Gazette-Journal has their list of endorsements out as well... point being, there's no shortage of material out there. My personal attitude is to do my own research as best I can and to trust those whom I know have more time and knowledge on their hands if necessary. Truth be told, though, most of you probably already have your mind made up on bigger races, anyway, so I'm going to start with the top of the ticket and work my way down to the races that are theoretically a little harder to sort out. To make life a little easier for those that are curious about which party line I'm voting, Republicans will be red, Democrats will be blue, Libertarians will be purple, and everyone else will be green. Let's make something clear - it really doesn't matter who I pick here because Mark Amodei is going to run away with this. It's not going to be close. His opponents are woefully underfunded and inexperienced or just a little too socially conservative for my taste. That said, I looked at the issues that Kristen Spees is running on and... she's not half bad. Don't take this the wrong way - if I thought she had a realistic shot at winning, I'd probably vote differently because she is woefully inexperienced, both politically and practically. She has an impressive background that I sincerely believe will pay off in another ten to twenty years or so, but, for now, she's all ingredients and no cake - honestly, if she were elected into Congress this year, I'm worried she'd be devoured whole. I will note that I harbor no ill will toward Rep. Amodei. His reaction toward Cliven Bundy and the Bunkerville standoff was uncharacteristically mature compared to the rest of Nevada's congressional delegation, neither demonizing nor lionizing either side, and his voting record, though not great, isn't horrible, at least by congressional standards. If I thought this race would be close - meaning, within 10% either way - I'd probably vote for him. However, I think it's important to communicate that, just because he's been good this long, it doesn't mean he has a blank check. Keep an eye on Kristen, though - I have the sneaking suspicion we'll be hearing from her again in the future. This isn't so much a vote for Sandoval as it is a vote against the other guys. Robert Goodman lost to "NONE OF THESE CANDIDATES" in the primary, which gives you a pretty good idea how Democrats feel about him, and David VanDerBeek is, well... how do I put this... nuts. I'm willing to vote for Kristen against Amodei because, in the highly unlikely event that she wins, I'm not going to regret my vote all that much. If I voted for any of the people running for Sandoval and they actually won, however... no. Just no. Not that it's going to happen, anyway, but still. No. Even so, I'm going to vote somewhat strategically on this one. Whoever wins this race will have a commanding position to run for Governor in 2016, assuming Sandoval runs for the Senate. Given that, demographically speaking, we can expect Nevada to have a strongly Democratic legislature, keeping a Republican in the Governor's Mansion will help ensure a small measure of political anarchy, if nothing else. Anything that keeps our state government in check is generally a good thing in my book. Oh, what about Mike Little? Well, by IAP standards, he's relatively sane, but that's sort of like having a relatively fast car compared to a stock VW Bug, a Geo Metro, and a cinder block. The closest I could find to his issues are the ones he mentions in his biography, which are certainly illuminating. If you want to issue a binding protest vote (remember - in Nevada, "NONE OF THESE CANDIDATES" has the same effect as choosing not to vote at all; if it didn't, Sandoval would be in a two-way race with VanDerBeek), you could do worse, I suppose. The Libertarian Party Voter Guide recommends her. I talked to our State Chair about her and he confirmed that she was one of the candidates that the Party leadership was quite enthusiastic about supporting - in fact, in the Voter Guide, she's listed as one of the four "Featured Candidates". Considering how they interviewed people for months, talking directly on the phone with various candidates, while I sat behind a keyboard for a few hours, I'm going to go ahead and trust their judgment on this one. If it helps, both the RGJ and the Reno News & Review endorsed Kate Marshall, which can't possibly be good. This is another one where I'm punting and trusting the LP Voter Guide. Both the RGJ and the RN&R endorsed her as well, which has to be good. He's the only CPA on the ballot, which is a pretty important qualification for the effective "Chief Financial Officer" of Nevada. Also, he has support in the LPNV's Voter Guide, the RGJ, and the RN&R, which, as we've established earlier, has to be good. Right? I'm not going to lie, I have some concerns about this one, but I had more than a few libertarians, both in and out of the LP, tell me that I really needed to give Adam a chance. When it comes to the higher profile races, unless you think you know something everyone else doesn't, you're sometimes better off outsourcing your choice to people you usually agree with and trust that have a little more time on their hands to dig into some of them, and all the people I trust are saying to vote for Adam Laxalt. So... I will trust them. This, to be bluntly honest, is Pat Hickey's race to lose. However, even though I don't think Niklas really has a snowball's chance in Hades, I really like the issues he's running on. If he wins, and if he's true to his word, I think he would be a legitimately superior choice in the Assembly than Hickey. I have no idea who he would caucus with, though. There's no way the GOP would let him anywhere near them if he unseated Hickey, and his agenda doesn't mesh with the Democrats in Nevada at all. In this case, I'm going for a "vote against the incumbent" strategy here. Also, this site is still a thing, and it looks like Washoe County's still trying desperately to fight it. A change in assessor might - just might - lead to a change in attitude. I don't have strong opinions either way on this one, which is a pretty good sign the County Clerk, currently Nancy Parent, is doing her job. I'd try to apply the "vote against the incumbent" strategy here as well, except Bobee appears to be running a paper campaign - put another way, she doesn't have a campaign web site and didn't respond to the RGJ's Voter Guide questionnaire. Similar logic to the County Clerk race listed above. Chase didn't bother responding to the RGJ's questionnaire and the campaign web site listed by the Washoe Democratic Party leads to her hypnotherapy practice's web site. Meanwhile, Don's the current Public Administrator, so there's that. Similar logic as the previous two races. Lawrence is the current County Recorder; meanwhile, Robert Townsend doesn't have a campaign site and didn't answer the RGJ questionnaire, nor does or did Don Cochran. If you're not going to take your campaign seriously, don't expect me to. Not that I have a choice - she's the only person in the race. 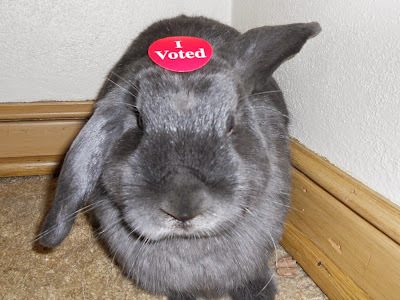 Good luck and happy voting, everyone!